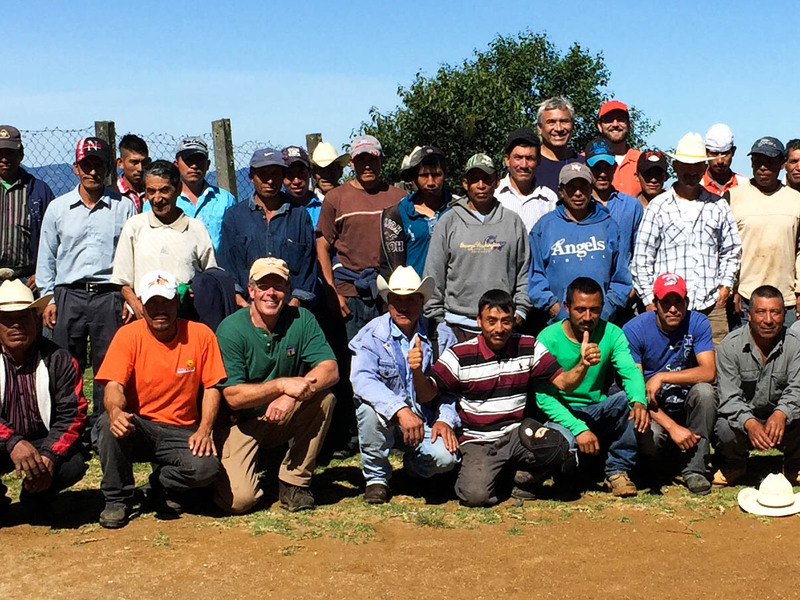 A six-day project scouting trip has brought a team of Michigan electric co-op employees home with details they’ll need to help bring electricity to a remote area of Guatemala. Jim Carpenter, Cherryland Electric line superintendent; Matt Monroe, Wolverine Power safety coordinator; Kevin Evans, Great Lakes Energy engineering analyst; and Dan King, MECA safety & loss control instructor, traveled June 22-27 to inspect the project site. Their main goal was to assess the whole job, including measuring for materials needed to build about 3 miles of primary and 1 mile of secondary line over steep terrain, and making design adjustments. “Throughout, we tried to take many pictures and notes to give to the guys who will be doing the work so they know better what to expect, whether the number of men scheduled to work are enough, and if the job can be completed in the set timeline,” Monroe said. Building the lines means battling harsh jungle terrain to connect the new lines to an existing grid. One-lane dirt roads are the only routes to the area, and it took the team about two hours to travel up the mountain. Battling the changing elements, getting crews adjusted physically to the elevation, and language will be the biggest challenges, Monroe and King agree. “I will have to brush up on my Spanish,” King said, and Monroe noted, “It seems like most of the crops are growing almost vertical. By comparison, one pole that was already set there was at 8,700 feet and I looked it up to find that Cadillac, Michigan, is at 1,309 feet.” It also turns cold at night, he said, and “it rained harder than I’ve ever seen – like a monsoon.” The village the team stayed in had no electricity, and they were housed in a school with a metal roof. Because the country is right near the equator, it also gets dark early (about 6:30 p.m.), and the day is done then because there are only candles and flashlights for lighting nighttime activities. Any generators are not used for long because of fuel costs. Due to limited resources, the team will also be checking the supply list closely. “What we bring is what we’ll have,” King said. Supplies are being coordinated with Wolverine Power Cooperative and will be shipped to Guatemala in a large portable box. Monroe and King will return in early November with eight lineworkers from Cherryland, Great Lakes Energy, Wolverine and HomeWorks Tri-County to complete the project. About 15-20 villagers will help with the groundwork, such as setting poles and stringing wire. “They’ll be our work support while we’re there,” King said. After the lines are energized, the new system will be maintained by two Guatemalan linemen whom King said they will meet with to make sure everything is all set before leaving. “We’ll also work to teach the local villagers about the dangers of electricity,” he said. The team’s work will make it possible for these Guatemalans to have things we believe we can’t live without, King adds. “This means things like indoor plumbing and getting water without pumping it by hand from a well. I’m sure they’ll start small with a lightbulb and then be able to add more comforts in time. Electricity will greatly benefit the local school, as well, and gives the people future options, such as building a medical facility. “What really strikes me is how serious they are about getting the job done and how much they appreciate that Michigan people came over to give them a hand and are taking the time to help,” King said.